I fell in love the minute I met her, and 27 years later, I’m still gaga over my baby girl. Carlene was here waiting when I got home from the hospital on Saturday, and except to run out for an oil change and car wash today, she has not NOT taken care of me ever since. The resident called me back and said she recommended I go to our local hospital to get checked out. Carlene drove me there me. It was 11:30. Four vials of blood, a shot of morphine and a chest x-ray later, I was strapped to a gurney and loaded in an ambulance. Carlene handed me my purse. I told her to go get some sleep and she said she’d be down in a few hours. 11 more vials of blood, two aspirations (to check for bacteria under my knee cap…oh yeah…THAT was fun), an ultrasound (to check for blood clots) and a shot of dilaudid later, Carlene arrived with a banana in her purse because she knew I wouldn’t have eaten for nearly 18 hours. All my tests checked out and the docs guessed the swelling was in response to such a major debridement, so I was discharged. Carlene loaded me in the car, surrounded me with pillows, and drove us to Panera where she rolled down a window, locked me in the car, and got us some food. Last night we watched “Connie and Carla” snuggled up on my twin bed. I could list all the things Carlene’s done to help me, like getting me safely from point A to point B, and helping me eat right and stay clean, but I’d be typing all night. Besides, those things aren’t the most important components of my recovery. Carlene’s presence is better for my knee than any narcotic. She is soothing and loving, funny and kind. We’re on the same snark level, and we love to discuss books and history. She’s the kind of friend we all dream of, let alone child we hope to bear. When I think of Carlene, I always get a sweet ache in my heart. I will miss her when she goes home Thursday, but I know with certainty that the next time I see her I will fall in love all over again. A quick note about my recent “theme” change to my blog. Those of you who use Firefox or a Mac computer have not been able to post comments or click through on links. I apologize for this. I tried to reset my theme to what it was before, but being the computer genius I’m not, I have been unsuccessful so far. So if you’re unable to leave a comments here and you’d like to contact me, feel free to send me an email at lynnbering@verizon.net. This entry was posted in Uncategorized on June 29, 2010 by Lynn Haraldson. What a sweet, sweet post – well, except for the part about going back to the hospital in an ambulance and all THAT! Yeesh! 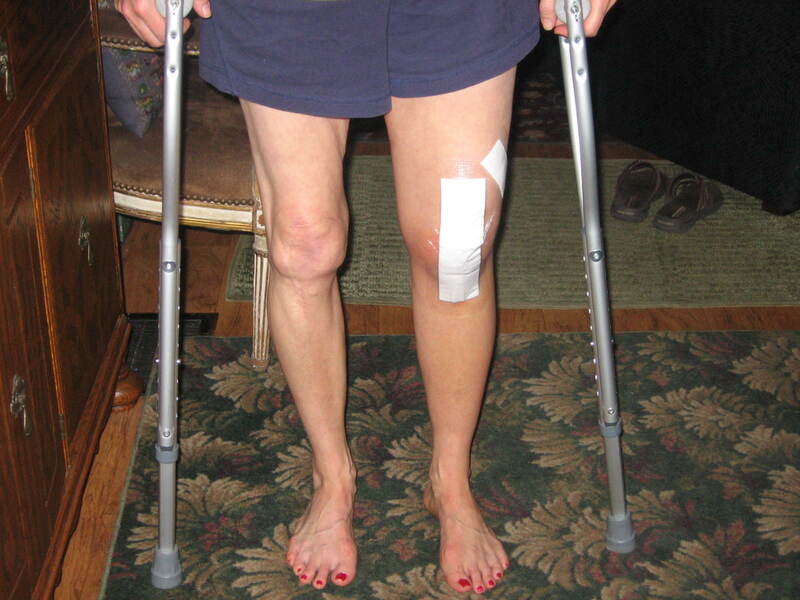 Good so see you standing up – boy is your leg still swollen (or as we like to say in Texas, “all swole up”)! Glad your recovery is going well, all things considered. Yikes! So glad to hear that you are doing better. Hang in there. It sounds like you and your daughter have a similar relationship as I have with my mom – very special and what a blessing! Love, love, love It's Complicated! I watched it while I nursed a pinched nerve in my neck. Very sweet post. Glad you're okay and very glad you have such a lovely daughter to care for you right now. I have one, too and she's a keeper! PS I have a MAC and have not had any trouble posting. I think the mac people who can't post are people like me who need to do their software updates more often! That cured it for me anyways. OMGosh. that is a lot of blood! What the heck were they doing? Well, at least they took it seriously and checked everything out. Ouch. Said in the most sympathetic tone I can muster. Ouch. ouch. ouch. Oh, Lynn, I can't believe you went through all that. You most definitely have a high threshhold for pain. Oh my! I can't believe you needed morphine and all that blood taken. I think you should be so proud of yourself for getting through all that because you had said you were scared before the surgery. I kind of am sitting here in awe of you! And that is so wonderful how helpful your daughter has been. You are so fortunate to have and the rest of your family around. Glad to see the smile on your face! I love your blog! Thanks for sharing the details of your surgery. Glad it's behind you and that you're recovering. How grateful you must be to have two wonderful daughters. When my children were small, and life could be exhausting, I didn't think about how they would one day return the love and care. Life is truly a circle, and the love of family makes it go around. Children are truly life's blessings. hope your knee recovers well! You've been thru and back! I'm glad you have your beautiful daughter to help you thru this season! God Bless!